Click here for audio of Episode 333. Today, an almost forgotten chapter on opening up the American West. The University of Houston's College of Engineering presents this series about the machines that make our civilization run, and the people whose ingenuity created them. The Northwest Passage was a great will-o-the-wisp for early explorers. Surely a water route could be found from the Atlantic to the Pacific. Surely! But where? The best we could do was to follow the St. Lawrence River up through Lake Ontario to Niagara Falls. After portaging around the Falls, we continued through the four western lakes: Erie, Huron, Michigan, and Superior. The route reached from the Atlantic to Duluth -- halfway across the continent. From the late 18th century on, this was a well-travelled route. And so its history is spelled out on the lake beds below. They're littered with ship hulks that tell a story about our technological emergence. Divers list over 500 wrecks. Those normally placid waters aren't as kind as we might think. Winter winds are vicious in the North. Tobermory Point, between Lake Huron and Georgian Bay, is the site of many wrecks within reach of divers. Here's the Arabia . Its name is ironic in its cold grave a hundred feet down. 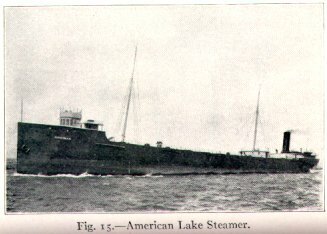 The Arabia was an early steamer that still carried sail. A terrible gale opened a leak in its side in 1884. The crew escaped in lifeboats, but the Arabia has still managed to claim lives. Below the thermoclines, the ship rests in permanent near-freezing temperatures. Many have died diving into its wreck unprepared for such cold. The Great Lakes hulks are pretty well preserved. Northern waters don't put a wreck under the same organic assault that warm salt seas do. The Arabia 's dim-lit anchors, chains, main wheel, and bowsprit all look like part of some Flying Dutchman , ready to rise and haunt the lake on icy winter nights. The Arabia went down carrying 20,000 bushels of corn. Fish like to swim around wrecks, so divers follow fishermen. But in this case, the trail was clearer than usual. Divers were led by stories about fish in one area that always turned up with blackened kernels of corn in their stomachs. Near the Arabia lies the Sweepstakes . Built in 1867, it sank in 1896, weighted down with a load of coal. It's older and made almost entirely of wood. It rests in shallow water, where it's been under attack, not by coral, but by surface ice. The old Northwest passage isn't used much today. Most Northern freight is now carried by trains and airplanes. But this was once a major highway. And the litter of sunken ships is a museum that spells out a rapidly fading chapter in American history. Morris, K. and Rowlands, P., Exploring Shipwrecks . New York: Gallery Books, 1988, pp. 62-79.